If you increase the weight of your club head, you will increase the club's swing weight. 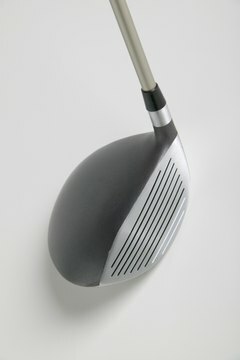 A golf club’s swing weight measures its "resistance to being swung in a circle,” according to Leaderboard.com. Swing weight does not measure a club’s total weight, but rather its distribution. Indeed, two clubs that weigh the same may have different swing weights. For example, if one of the identically-weighted clubs has a heavier head, it will have a greater swing weight. The swing weight scale was developed in the 1920s by club maker Robert Adams, although some credit Kenneth Smith, who developed the fulcrum scale used to measure swing weight. While the scale is basically arbitrary, it has survived to become the standard. The swing weight scale places clubs in categories with letter designations -- A through F. Each letter is then subdivided into tenths -- from zero tenths to nine tenths. The greater the letter or number, the heavier the club’s swing weight. Therefore, a club with a swing weight of D1 is heaver than a club with a C1 swing weight, and a D4 club has a slightly greater swing weight than a D2. A typical men’s club has a swing weight of about D0, while the standard swing weight for a women’s club is approximately C6. A club’s swing weight is affected by the weight of its three main components -- the head, shaft and grip -- as well as the shaft’s length and balance point. Altering any of these five items will change the club’s swing weight. A quick and easy way to increase a club’s swing weight is to add lead tape to the club head. Adding tape to the grip will decrease the swing weight. The precise amount of increase or decrease will depend on the club’s overall characteristics. As a general rule, however, to increase swing weight from D2 to D4, add four 2-inch-long strips of 1/2-inch-wide lead tape to the club head. To increase swing weight from D2 to D4 you can add about 4 grams of weight to the club head, subtract 10 grams of weight from the grip or lengthen the shaft by 1/3 inch. Altering the swing weight by changing the shaft’s weight is a little trickier, but you will increase the swing weight by approximately one unit for each 9 grams of weight you add to the shaft. Some club fitters believe swing weights should remain fairly consistent throughout a player’s set of clubs, so each will have a similar feel. Others believe the driver should have the lowest swing weight, with the short irons and wedges having slightly heavier swing weights.